This site is located in the hills just SE of the City of Cayucos and North of the Torro Creek Road. Access is off of Highway 1. We ask anyone new to the site that they be accompanied to top by a knowledgeable local pilot or instructor. Launch is at the top of hill with wind sock/streamers. With appropriate conditions you can launch in just about any direction except east. Do not land in open area south of hill as you may well be prosecuted for trespassing. (Private ranch boundary line is marked by first fence just south of launch). 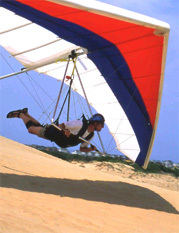 Recommended landing sites for Paragliders is the beach, preferable just south of last southern beach front house (near public access). Use limited parking available to pick up pilots only (vehicles not going up the hill usually are park across highway 1 near fire station. 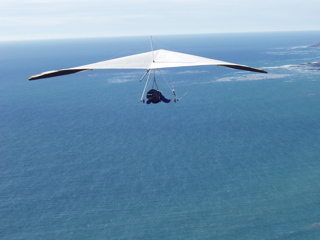 The recommended Hang Glider LZ is located in front of a small parking area along Highway 1 across from Torro Creek Road (approximately 1 mile south of the of the last beach house). 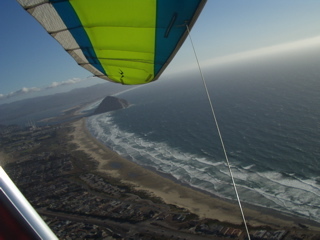 Another landing location often used by Hang Gliders is the beach area just off a Public Parking lot NW of the Launch (north side of large open space between beach front houses). With appropriate conditions, top landings are achievable, but watch out for lee side rotor, people, and vehicles. Bail out LZ is located in mid way up the hill on the NW side and a clear area just above the highest house SW side near the south access road. Highly recommended that new pilots should be accompanied and checked out on hazards and appropriate use of this site by knowledgeable local pilots before flying this site. Skills level required by site conditions: Intermediate level pilot (H-3, P-3), Novice level pilot recommended with 'instructor' supervision. Please use only designated areas for launching and landing. See description below. All pilots should wear a helmet and a reserve parachute. Not recommended for pilot training due the significant hazards present to the unskilled and unfamiliar. See Hazards below. Special Note: We have only the forbearance of the property owners and no official authority to fly this site. The Launch and its access roads are owned by a number of private and public entities. It is currently leased to cattlemen, keep all gates closed after entering or leaving. And please Drive Slowly (< 15mph) on surface streets leading through residential area to dirt access road. Be respectful to the site and its neighbors and maybe will be able to fly it for many more years to come. 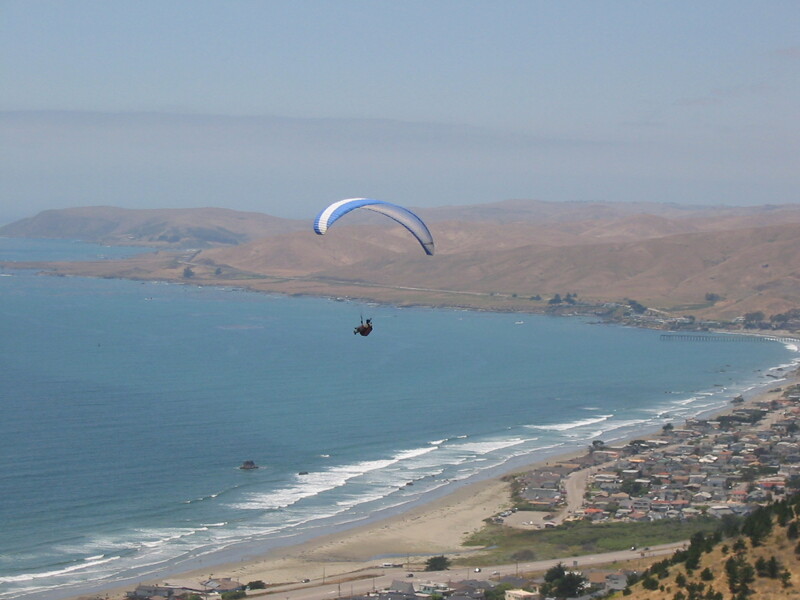 Special Notice to Powered Paragliders and Hang Gliders: We ask that all motorized beach launches and landings be conducted at the Torro Creek LZ. Due to the sensitive nature of the site, we also implore those pilots to not fly in close vicinity to the residential areas along the beach (ie >500' above). If a pilot must land in the area of the residences, please shut down the motor if safe to do so. It is a long way to the beach. Between the hill and the beach are barbwire fences, residential housing, highway 1, and more residential beach housing. Make sure you have adequate altitude before venturing over these obstructions. This is the reason we recommend only experience pilots and do not recommend training on this hill. Intermittently good most of year, best in spring. Can launch SW to NNW winds. Ridge and some thermal influence when warm. Occasionally a convergence can form forward of launch and along beach. Site does tend to thermal Block above or in front of beach areas, which coupled with strong on shore ocean winds can result in rotor and very turbulent conditions in front of launch even when conditions at launch appear favorable. Proceed with care.